How to Fix Microsoft Outlook Stuck at Loading Profile Screen Easily? Many users have been reported that when they launch Microsoft Outlook email client on Windows 10 OS, their Outlook 2016 and below versions halt at loading profile screen. This technical error; Outlook stuck on the loading screen in safe mode and in normal mode is very common and can be seen in Microsoft Outlook 2007, 2010, 2013, 2016 to Outlook 2019. 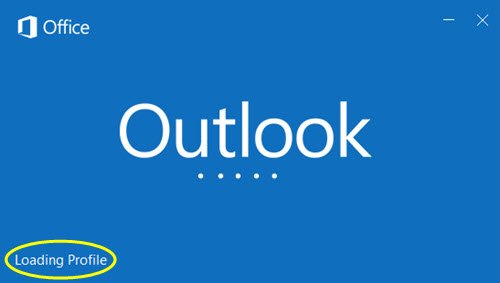 If you are facing this Outlook stuck at loading profile screen issue currently and cannot access the Outlook account and its mailbox properly, then here we explain the real cause and remedies to this problem. Users must know the real cause of this technical error. So, they can prevent Microsoft Outlook in future from halting or getting stuck at the ‘Loading Profile’ screen issue. This situation can appear in Microsoft Outlook when any of the below situations are true. 1. When users have Microsoft Office 2013 SP1 installed as a Windows Installer-based (MSI) installation. It might be possible that users have Click-to-Run version of Office installed. 2. Users must have minimum two graphics card integrated with the system. One card should belong to NVIDIA and the rest one must be of Intel(R) HD Graphics 4000 card. 3. It could be possible that hardware graphics acceleration option, which is managed by the Operating system is not marked as selected for Outlook options. 4. Outlook hangs when its data files are corrupted, a user can face issues like Outlook stuck at loading profile screen when Outlook PST file is damaged. The user needs to run ScanPST.exe to fix minor corruptions in PST file. In case of severe corruption and for inaccessible PST file, use SysTools Outlook PST Recovery Tool to repair and recover Outlook PST file efficiently. Note: The same issue also happens in Microsoft Outlook 2013 installation that does not have SP1 configuration. Generally, there are two workarounds through which this technical error can be repaired in the MS Outlook application. So, let’s check out each method in a detailed manner. It is a temporary workaround that can be preferred to fix Outlook stops on loading profile issue. In this, we put the DisableHardwareAcceleration registry subkey with the help of following instructions. 1. Close all the opened Office programs. · In Windows 7, click on the Windows Start button and type regedit in the search bar. Afterward, select regedit.exe from the results. · In Windows 8, navigate the mouse to top-right corner on Windows and click Search. After that, type regedit in the text box. Then, select regedit.exe from the resultant results. 3. Find and then select the below-mentioned registry subkey. 4. Click on Edit menu, go to New and select DWORD Value. 5. Next, enter DisableHardwareAcceleration and hit the Enter key. 6. Perform right-click on DisableHardwareAcceleration and select Modify under the Details pane. 7. Type 1 in the box of Value data and click OK.
8. Close Registry Editor and launch Outlook on the system. Verify that the Outlook stuck at loading profile screen issue is resolved or not. In this workaround, we are going to update the video drivers. So, users can re-enable hardware acceleration option for Office. 1. Initially, click on Windows Start button. 2. Next, write Windows Update in the search bar. 3. From the search results, navigate to Check for updates option. 4. If system updates are available, then move the cursor to the driver that you want to install and select Install. 1. On the home screen, click on Settings from the Charms menu bar. 2. After that, you need to click on the Change PC Settings option. 3. Select Windows Update from the settings application. 4. Navigate to Check for updates options. 5. If the update exists, then upgrade the driver that you want to install. Note: Graphic or Video Card manufactures routinely release updates for the drivers. These updates help to enhance the performance of drivers or repair the compatibility factors with other applications. In such a situation when users do not get the update for their drivers, then contact the support team of your video card and ask them how to get the new update for the video card. Once the users updated the drivers successfully, go back to the first method and follow the instructions. However, this time you need to eliminate the Disable hardware graphics acceleration option. Still, Outlook Stuck at Loading Profile Screen, But Why? If the problem does not resolve by the above-mentioned workaround, then it might be possible that the Outlook PST file can be corrupted. The PST file is a local storage file that saves the copy of Outlook data items on the hard-drive. It also has a certain storage limit depending upon the Microsoft Outlook version. When it crosses its maximum limit of storage, it starts creating performance issue problems and sometime Outlook freezes and crashes. In order to resolve this problem, users can go with the SysTools Outlook Recovery Tool as suggested above. It is a dynamic tool that can scan the highly corrupted .pst file and convert them into a healthy one. The best part about utility is it supports all Outlook versions like 2019, 2016, 2013, 2010, 2007, 2003, 2002, 2000 as well as Windows OS versions. Important Note: Repairing MS Outlook PST file is not a difficult task when using a reliable and trustable application. If your MS Outlook hangs, crashes or get stuck due to PST file issues, then repair PST file without any data loss using this software. A reliable application will help you fix the issues without any data loss from your mailbox.